Green roofs deliver multiple benefits to the building as well as the environment around it. A green roof system reduces the impact of the urban heat island effect, improves air quality, increases absorption of carbon dioxide and supports biodiversity. Green roofs reduce heating and air conditioning costs, and improve building efficiency through thermal and sound insulation, resulting in financial benefits for the building owner. Green roofs also extend the lifespan of the roofing system. The proven benefits of green roofs have resulted in significant growth in the adoption of green roofs: By March 2014, the City of Sydney recorded more than 98,000 square metres of green roofs and walls installed in addition to receiving an average of one application per week to implement a green roof or wall. 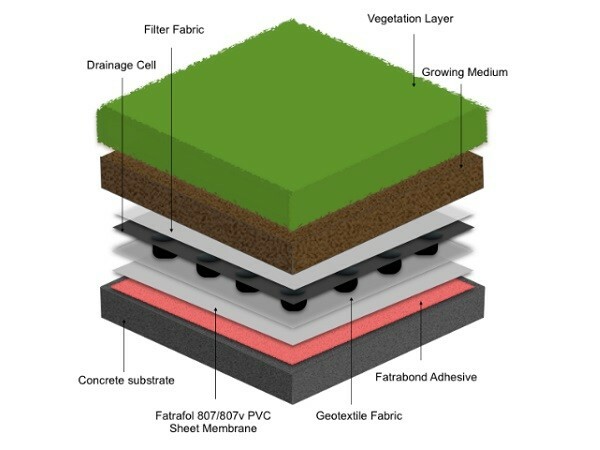 A green roof system is implemented by using fully bonded membranes such as Fatrafol 807 or 807v PVC membranes from Fatra Australia depending on the site, along with adequate drainage cells and filter layers based on the vegetation build-up of the green roof.